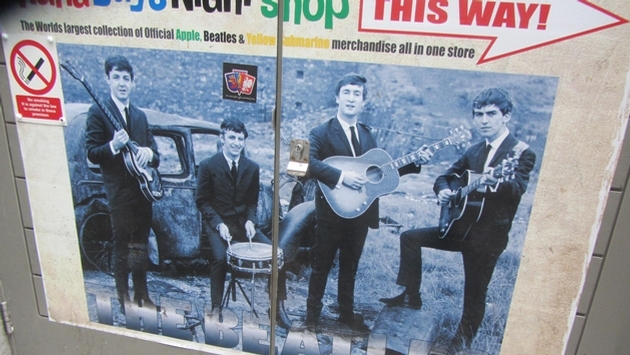 The Beatles are everywhere in Liverpool. Their faces are painted on store windows, their music is played almost everywhere and they’ve become the most important hook in the city’s tourism. 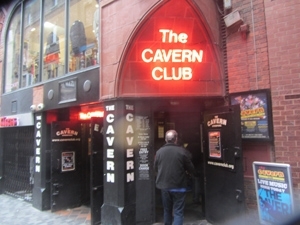 Crowds of people gather outside the Cavern Club where the band played more than 200 times before hitting the big time in the U.S.A. Down on Albert Dock, not 100 yards from The Beatle Story, The Magical Mystery Tour goes off in a bus colored as yellow as the submarine bringing people to Penny Lane, Strawberry Fields and the boyhood homes of John, Paul, George and Ringo. 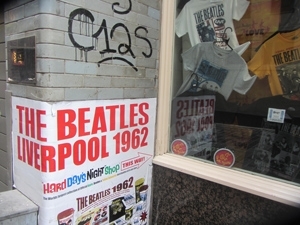 As a lifelong Beatle fan, I did all of the above during my stay in Liverpool, a town with more than 700 years of history, almost all of it tied to the docks of the Mersey River, once England’s second largest port. It felt a bit strange to do the Liverpool Beatles circuit and to see them in the kind of institutional light that one brings to a historical tour. There’s a comfortable separation in most historic tours, whether they’re exploring the battlefield at Gettysburg, the prison cell of Nelson Mandela at Robben Island or Martin Luther’s cell in Erfurt. I would soon turn 10 years old when I watched the Ed Sullivan Show on Feb. 9, 1964. I bought the 45 with “She Loves You” on one side and I believe it was “I saw her Standing There” on the other. I bought a Beatles wig and Beatles boots at Two Guys from Harrison in Hackensack, N.J. And as I went through my teenage years, the Beatles seemed to evolve along a parallel path and stayed with me on that path along with Bob Dylan and some others throughout my life. How could I view the creative places of Beatles songs, so intimately woven into the fabric of my life, through the official eyes of tourism? If it sounds trivial to compare a rock group to something as epic as Gettysburg or the struggle against Apartheid, I’d remind you how important the Beatles were in the Winter of 1964 after the November of 1963 had crashed down on us like the cacophony does that careens through one of the Beatles’ greatest songs, A Day in the Life. I still remember that dark weight that fell on my family when JFK was murdered, how it could be felt at the dinner table and among my teachers and friends in the classroom. The darkness of the JFK assassination was the background against which that bright youthful vigor of the Beatles exploded. Somehow the Beatles restored the youthful promise that was lost in Dallas that previous Nov. 23. The Beatles were the first good news after a season of darkness and oppression. At first glance, Liverpool seems an unlikely incubator for so much inspiration, especially the Liverpool of the Beatles. When they were children, much of the city was still in the ruins left by relentless Luftwaffe bombings. Looking at their childhood homes it’s plain that they came from ordinary people without much money or many pretentions. Outside the National Trust-listed home of Paul McCartney, we learn that he wrote 100 songs in its bathroom because it was private space in a teeny weeny flat and it had great sound. We learn that “Nothing to get hung about,” is how the young John Lennon assured his aunt that he wouldn’t get in too much trouble for trespassing on Strawberry Fields. We learn that George Harrison drew pictures of guitars as he sat in his grammar school classes. Thank goodness for that resounding piano chord at the song’s end, that somehow restores enough order to plant a little hope, to wake up and get out of bed. America and Liverpool have a special connection. The city was home to our first overseas consular office; in fact Nathaniel Hawthorne worked in it for four years. Millions of immigrants made the journey from Liverpool to Ellis Island and still others arrived on ships built in Liverpool and sailed by her crews to the American slave markets explained in the city’s Slavery Museum. The history’s had its bright moment and its dark, but in sending us the Beatles, Liverpool sent us a lifeline of hope in a very dark hour that I still remember well and this American is still thankful for it.